Immerse yourself in the world of this wonderful art. You can also attach company names or logos with special glass that glows in the night. Immerse yourself in the wonderful world of mosaic art! 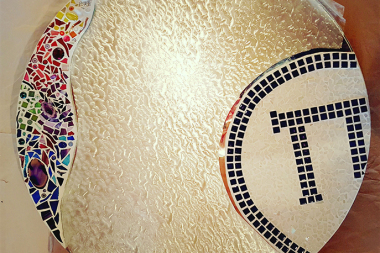 You will create your picture out of many small broken tile pieces (mosaic and Tiffany) and will then start to stick the many individual pieces together using a special glue. You must leave your artwork to dry for 24 hours before you start the grouting which is why we usually do this bit for you. Alternatively, though, you can also plan to do the grouting on day 3. You can also apply your company name or logo onto the ball using special glass which lights up at night − this is sure to make your company's entrance area quite an attraction, also in the dark! Guided by a qualified art therapist, you will work in groups of 4 or 5 on a ball with a diameter of 50 cm. As you will take it in turns to work, this event really promotes team work − as you have to be prepared for your colleagues to do things differently to how you might do them (whilst you cut, another person will continue what you have started). This also supports and promotes many important everyday characteristics: the ability to deal with conflict, flexibility, creativity, tolerance and generousness. What's more, the dialogue between the individual team members is also promoted and this, in turn, strengthens team spirit. Who isn't fascinated by the endlessness of the ball − you can turn it in any direction and still you can't find an end or a beginning. Balls and circles belong to the most important and oldest symbols of human civilisation. For thousands of years the geometry of the circle and ball/sphere has been symbolic of the world's order. 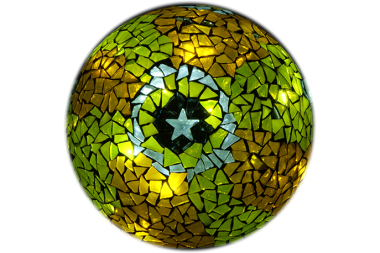 If you like working with glass and want to put your ideas in glass art, Tiffany and mosaics into practice, you have come to the right place! 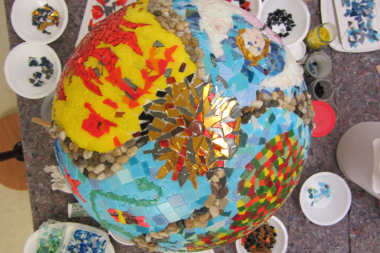 Besides the large ball, there are also numerous other mosaic options for you to try and the activity is also an excellent team building event as you all work together. The event also has strong symbolic power with team changes: the glass is cut into small pieces and put together again in a different form.